... raised to cherish cultural and humanitarian values. He made his first mathematical discovery at the age of five when he worked out the formula for the sum of an arithmetic progression. On 30 January 1933 Hitler came to power in Germany and it was immediately clear that those of Jewish origin would suffer. Later in 1933 Elias Straus died of cancer and right after this Rahel Straus and the rest of the family moved to Palestine and made their home in Jerusalem. There Rahel practised medicine and became very active in social work. Ernst attended a number of different schools but he had no high school diploma when he entered the Hebrew University. There he was taught by Motzkin who later emigrated to the United States and undertook joint work with Straus which we will discuss below. Again Straus had no undergraduate degree when he went to the United States and enrolled in Columbia University in New York in 1941. He obtained his Master's degree in 1942 and continued to undertake research towards his doctorate under F J Murray. However the most significant event in his career happened two years later when Einstein selected him as his assistant. Before moving to Princeton, Straus married Louise Miller who was, like him, a graduate student at Columbia University. They married in the autumn of 1944 and moved to Princeton where Straus began working with Einstein at the Institute for Advanced Study. Louise and Ernst had two sons, Daniel born in 1954 and Paul born in 1957. It is assumed that the gravitational potentials and their first derivatives will be continuous at the boundary of the spherically symmetric star. An approximate solution of the field equations for empty space is obtained and the gravitational potentials thus determined are required to piece together continuously with the known gravitational potentials for a pressure free, spatially constant density of matter. Under these conditions it is possible to show that the Schwarzschild field can be transformed into a solution of the problem. In 1946 Straus and Einstein published A generalization of the relativistic theory of gravitation II in the Annals of Mathematics. This presented a new derivation of the field equations which was necessary since the derivation in Einstein's single authored paper published in the previous year was based on an error. Straus submitted his doctoral thesis on Einstein's unified field theory to Columbia University and was awarded his doctorate in 1948. He published Some results in Einstein's unified field theory in 1949 which was based on his thesis. ... geometry, convexity, combinatorics, group theory and linear algebra. Let us illustrate with some examples of his work. In 1949 Straus collaborated with Richard Bellman publishing Continued fractions, algebraic functions and the Padé table in which they gave a method for obtaining the rational approximants of Frobenius-Padé for power series expansions of algebraic functions. 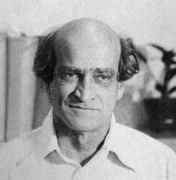 In 1950 he published On entire functions with algebraic derivatives at certain algebraic points and in the following year On the polynomials whose derivatives have integral values at the integers. In 1956 he published two papers with Olga Taussky-Todd in the Pacific Journal of Mathematics. The first, with two additional coauthors, was On the number of absolute points of a correlation and the next paper in the Journal was Remark on the preceding paper. Algebraic equations satisfied by roots of natural numbers. Let us note that Straus had a close association with the Pacific Journal of Mathematics being on the editorial board from 1951 to 1964, and being the managing editor between 1954 and 1959. In 1956, in addition to the papers mention above, he published A characteristic property of the circle, ellipse, and hyperbola in the American Mathematical Monthly with Paul Kelly. This paper proves the converse of the fact that a conic has the same pedal curve with respect to either focus. Two years later Straus published Curvature in Hilbert geometries also written jointly with Kelly. His joint work with Motzkin, which we referred to above, was on graph theory. Together they obtained some of the first results which went beyond Turán's theorem on graphs containing no complete subgraphs. This work provided one of the foundations of extremal graph theory. Straus wrote 21 joint papers with Erdős. Their work was again basic in developing a new theory, this time it was Euclidean Ramsey theory. In On the maximal number of pairwise orthogonal Latin squares of a given order (1960) Straus, together with Erdős and Chowla, showed that the number of pairwise orthogonal Latin squares of order n is greater than (1/3)n1/91. This gave a lower bound than that found by R C Bose, E T Parker and S S Shrikhande when they disproved the Euler conjecture. An earlier joint paper by Straus and Erdős was On linear independence of sequences in a Banach space (1953). Another combinatorics paper was On a problem in the theory of partitions (1962). In this Straus showed that for every positive integer n, there exists a set A(m,n) of positive integers such that n has exactly m partitions into elements of A(m,n) for every m, 1 ≤ m ≤ p(n), where p(n) is the number of partitions of n. In 1971 his paper Nonaveraging sets discussed sets of integers with the property that they contain no integer that is the average of any subset of size at least two. Straus died of a massive heart attack at the age of 61. An encounter with Ernst, even a routine one such as at the departmental lunch table, was usually unforgettable. He moved effortlessly and brilliantly from scientific subjects to history, religion and politics, punctuating his talk with anecdotes and stories from his vast knowledge and experience. Ernst Straus was not only a great mathematician, but also a great human being. ... His brilliance and enormous erudition in both humanities and science made a deep impression on all who were fortunate enough to know him. He could solve crossword puzzles in ink in English (his third language) using only the horizontal clues, and in the next minute discourse profoundly on relativity theory, European history, or theology. This intellectual power was combined with a deep and radiant humanity which made Ernst truly beloved by his colleagues, students, and friends. It was always a delight to visit his home, which was filled with mutually coexisting animals of all descriptions. It almost seemed that the animals had responded to his lifelong dedication to pacifism. Ernst worked tirelessly on behalf of men and women who were unjustly persecuted by their governments for speaking out in defence of freedom. He was extremely active in the anti-Vietnam war movement and, until the day before his death, he took an active part in efforts to bring about a nuclear freeze. Men of such great talent, uncompromising integrity, generosity, and gentlemen are among the world's rarest and most precious treasures.